This entry was posted in Uncategorized and tagged Chimamanda Ngozi Adichie, Doctor Who, Feminism, John Barrowman, LGBT, Transgender, Transgender Tardis, Transmisogyny, Transphobia on July 24, 2017 by Sam Hope. As a feminist, I’m sure you can imagine I was outraged by the idea of men only groups without women only groups. But I was assured the situation is different within the trans community, because trans women “dominate” the discussion and are over-represented, so man-only spaces are needed. It wasn’t long before the underlying belief was voiced – a trans man boldly stated that trans women have louder voices because they were raised in male privilege. What scares me is that hardly anyone seemed to bat an eyelid at this statement. If this is going to be the underlying assumption influencing Stonewall’s thinking about trans people, then we are moving into dangerous territory. The idea that trans women have louder voices in the community because of male privilege is an assumption based in a repeated myth from second wave feminist spaces, reiterated so often it begins to sound true. I believe the reality is that trans women, due to the unique oppressions they face, often have to learn to be “fighty” when it isn’t actually in their nature or upbringing at all. Most of the fight I’ve experienced in my trans women friends has developed as they transition – it is a response to their experience of oppression. The association with “maleness” is a lazy and unfounded leap, based on a transparently false assumption that all AMAB people are socialized with identical traits. I also see trans men, who generally get listened to without the need to shout, being worryingly uncomfortable about acknowledging the structural inequality between themselves and trans women. While I agree trans men also experience some misogyny when they are perceived as women, I am not sure how many trans men or AFAB non-binary folks are aware of how toxic an entity transmisogyny is – that is the specific violence that is targeted at AMAB people when they expose even the slightest hint of their femininity. Transmisogyny is linked to society’s undervaluing and violence towards everything that is perceived as feminine, which is in turn an enormous part of what underpins the structural inequality between the sexes. Trans men do not experience societal violence in the way trans women do, because becoming more “manly” and “masculine” is not seen as faulty or transgressive in the same way – femininity is cast, even by some feminists, as weak, artificial, pointless, valueless, and of course, inherently sexual. This means that trans women are more scrutinised and suspect, and experience higher rates of harassment, violence and murder. There is less social stigma in somebody assigned female wanting what’s perceived as a male role, male dress or male occupation. The evidence of the inequality between trans men and women can also be shown in this article about pay and employment. Trans men are also less visible – pre-transition, they can dress as they choose with less stigma, post-transition, they are more likely to “pass” because of the one-way effects of male hormonal puberty. Because of this, most trans guys I know are not as interested in being involved with a trans community, except for a brief period while they are more visible during transition. It’s not a good thing for any person to feel compelled to hide their history in order to feel safe, but reality is a lot of trans guys can and do hide – they choose to quietly live their lives and not be visible. Trans women receive a greater degree of social stigma and harassment, often coupled with increased visibility. Understandable, then, if they throw themselves more into activism, get more angry. But just as has been said to many feminists over the years in order to put women back in their place, trans women who speak up are told they are “acting like men”. That such statements come from within the trans community is especially troubling. Trans men who say they don’t have a voice, who cry “what about the men?” are replicating something that is happening everywhere. That we see it as being outrageous that trans spaces are women-led says a lot about how we think about women, and echoes how threatened cis men feel by women-dominated feminist spaces. Hooray for women-dominated spaces, I say – how dare we as a community twist that and misgender trans women rather than admiring the long fight and painstaking social organizing that has helped trans women fight back against the forces of their oppression. Sure, trans men and AFAB trans folks need to be more visible, but we do that by taking our place within the community and not minding having our masculine expectations shattered – we are not the most important people here. I have no problem with more leaders in the trans community being women. I accept that transfeminine people are at greater risk in our society; they experience societal violence from birth, in the form of physical, sexual and emotional attack on all perceived femininity in assigned male people. I am less afraid of loud and fighty trans women than I am of a community of trans women who meekly learn to “know their place” in order to rebut accusations of maleness. 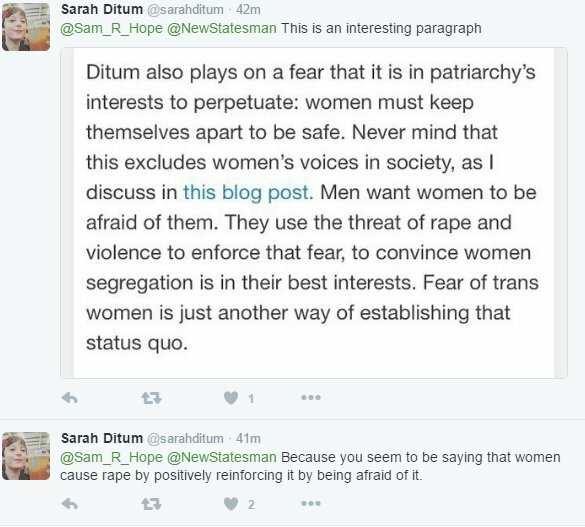 I also fear that in being seen as the “default” trans person, trans women will have their unique experiences as women invisibilised, and will quickly lose their ability to speak about transmisogyny as women’s issues once again get swept to the side in favour of the issues that affect men too. This is a crucial time in the evolution of our relationship with Stonewall – allowing lazy assumptions about the male privilege of trans women to pass unchallenged could have a long term impact on how Stonewall handles future issues. edit – after feedback, I’ve edited two sloppy bits of wording – I was never against men-only groups if there are women-only groups in parallel, and suggesting masculine clothing on AFAB folks goes without comment was definitely an overstatement. Apologies to those whose cages were unnecessarily rattled by my poor choice of words. This entry was posted in Uncategorized and tagged Feminism, LGBT, Trans Inclusion, Transgender, Transmisogyny on October 28, 2014 by Sam Hope.